Shoulder Arthroplasty Market was valued at $1,080 million in 2016, and is expected to reach $1,814 million by 2023, registering a CAGR of 7.6% from 2017 to 2023. Shoulder arthroplasty is a surgical procedure, which assists in the treatment of severe pain and stiffness in people suffering from various forms of arthritis or degenerative joint disease of the shoulder joint. Shoulder arthroplasty procedures have witnessed an elevating demand over the years, owing to several benefits offered by these procedures such as pain relief and restoring motion, strength, and function. The adoption of shoulder arthroplasty is rising among people, as it assists patients to return to normal activity levels in short time duration. The growth of the global shoulder arthroplasty market is driven by increase in prevalence of arthritis-associated disorders, such as osteoarthritis and rheumatoid arthritis, and rise in geriatric population. In addition, surge in adoption of reverse shoulder arthroplasty by surgeons and increase in the number of sports-related injuries have significantly contributed to the market growth. However, postoperative complications associated with shoulder arthroplasties and high costs of sophisticated shoulder arthroplasty devices hamper the market growth. The shoulder arthroplasty market is segmented based on procedure, device, indication, end user, and region. On the basis of procedure, the market is divided into partial shoulder arthroplasty, total shoulder arthroplasty, and revision shoulder arthroplasty. By device, it is categorized into shoulder arthroplasty resurfacing implants, shoulder arthroplasty trauma devices, and shoulder arthroplasty platform systems. Depending on indication, it is classified into arthritis, fracture/dislocation, rotator cuff tear arthropathy, Hill Sachs defect, and other. According to end user, it is fragmented into hospitals & clinics and outpatient surgical centers. Regionally, the market is analyzed across North America, Europe, Asia-Pacific, and LAMEA. The impact of the driving factors is expected to surpass that of the restraints. Increase in investment by the key players in untapped regions is expected to offer lucrative opportunities for the expansion of the global shoulder arthroplasty market. Japan accounted for the highest share in the Asia-Pacific shoulder arthroplasty market in 2016, and is projected to continue this trend throughout the forecast period. This is attributed to the expansion of key market players offering arthroplasty devices in this country. For instance, Exactech Inc., a manufacturer of bone and joint restoration products for extremities, announced the approval of first clinical use shoulder replacement systems in Japan in June 2017. The report provides a comprehensive analysis of the key players operating in the global shoulder arthroplasty market such as Wright Medical Group, Inc. /Tornier Inc., Integra LifeSciences Corporation, Zimmer Biomet, Johnson & Johnson (DePuy Synthes), Arthrex, Inc., Smith and Nephew Plc, Conmed Corporation, DJO Global, Evolutis, and Exactech, Inc. The other key players in the value chain include Implantcast GmbH, Lima Corporate, Medacta International, Kinamed Incorporated, Corin, Imascap SAS, Catalyst Orthoscience., Biotechni, Cayenne Medical, and BioTek Instruments, Inc. The study provides an in-depth analysis with the current trends and future estimations of the global shoulder arthroplasty market to elucidate the imminent investment pockets. 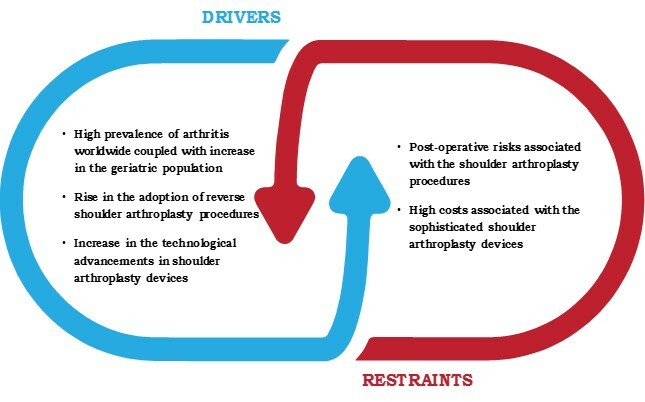 Extensive analysis of key segments of the industry is provided to understand the type of shoulder arthroplasties used globally. 9.1. WRIGHT MEDICAL GROUP, INC. /TORNIER INC. Shoulder arthroplasty is gaining traction over the years, as it has become the choice of treatment for the people suffering from arthritis. In addition, osteoarthritis (OA) is considered to be the most common joint disorder in the U.S. with increasing prevalence of symptomatic OA among the geriatric population. Large-scale adoption of total shoulder arthroplasty procedures by surgeons is witnessed over the years. This is attributed to the greater range of motion of the shoulder joint offered after the surgery along with less complications, accounting for approximately 93% of procedures being successful. Several devices are incorporated in shoulder arthroplasty procedures such as resurfacing implants, trauma-specific implants, and shoulder replacement platform systems. The shoulder resurfacing implants are dominantly utilized in the shoulder arthroplasty surgeries as the former aims to preserve more of a patient’s bone and provide a more conservative approach to conventional total shoulder replacement surgery for the treatment of glenohumeral arthritis, humeral head fractures, and osteochondral lesions. However, shoulder platform systems have registered the highest CAGR of 8.4% from 2017 to 2023, owing to increase in investment by key players for the development of the same. Fracture or dislocation of shoulder joint is the second leading indication in 2016, and is anticipated to maintain this trend throughout the forecast period. This is attributed to the increase in incidence of proximal humerus fractures, being the third most common fracture in elderly patients. However, rotator cuff tear arthropathy segment has witnessed the highest growth rate, due to rapid increase in the incidence of rotator cuff tear. Hospitals & clinics segment shows high utilization of shoulder arthroplasty devices, generating the highest revenue in 2016, and is anticipated to continue this trend throughout the forecast period. This is attributed to the large number of total reverse shoulder arthroplasty procedures performed in the hospitals and clinics. However, the outpatient surgical centers segment is projected to grow at a high pace, as the total shoulder arthroplasty procedures can be performed safely using ambulatory perineural local anesthetic infusion. Moreover, increase in preference of patients to outpatient surgical facilities owing to reduced length of stay and cost of surgery boosts the demand for shoulder arthroplasty procedures carried out in outpatient surgical centers. Increase in the geriatric population across the globe and rise in incidence of osteoarthritis are the major drivers of the market. Technological advancements related to the shoulder arthroplasty implants, including fracture repair devices and arthroplasty platform systems, supplement the market growth.